The ARC Centre of Excellence for Coral Reef Studies is seeking applications from exceptional students to enroll in a PhD under the supervision of leading researchers at its four nodes around Australia (James Cook University, the Australian National University, the University of Queensland and the University of Western Australia). The scholarship cycle in Australia is on a calendar basis with closing dates for international and domestic applications between August and October; both with an expected starting date for successful applicants at the beginning of the following year. Suitable applicants will be required to go through a formal application at the relevant University and, if successful, will be awarded a scholarship and tuition waiver. Depending on the University and supervisor, there may be the possibility, in the case of outstanding applicants, for a top-up to their scholarship. To be competitive for a scholarship and fee waiver, applicants must have an Honours degree or Masters degree, preferably with a publication if you are international. Many student applicants come with scholarships from another funding source such as granting agencies in their home country. We are happy to deal with these applications at any time of the year. Acceptance is dependent on the applicant meeting our academic criteria, has been accepted by a suitable supervisor and meets the language requirements. The following leading researchers in the Centre have expressed an interest in recruiting new exceptional PhD students. Their email addresses and areas of interest for research projects are listed below. If you are interested, please contact one of the following to discuss opportunities. Please also copy all correspondence to the Assistant Director Alana Grech (alana.grech@jcu.edu.au) who oversees the process. Evolution and ecology of reef fishes. My research focuses on how ocean dynamics shape coral reef systems, using a combination of field studies and numerical modelling. Students with quantitative backgrounds in oceanography, the geosciences, or related fields are especially encouraged to discuss research opportunities. 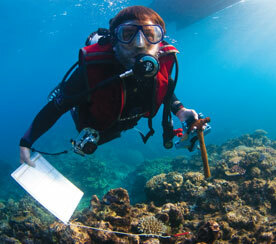 My research program focusses on the response of corals to climate change and ocean acidification. Students with a background in geochemistry and biochemistry are especially encouraged to discuss research opportunities. Long-term coral proxy records of climate change including ocean acidification, ocean warming and river runoff.